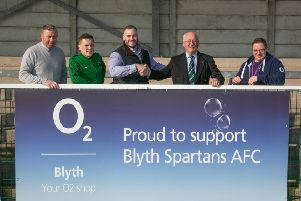 Blyth Spartans manager Tom Wade was disappointed that his team failed to come away with three points from Nantwich on Tuesday. A Dan Maguire equaliser was all they had to show from a dominant display in Cheshire. “If we’d played them on a Saturday we’d have won it comfortably,” said Wade. “It was a long journey down to Cheshire and we arrived late, which didn’t help us. Even so some of the football we played was awesome. We were passing the ball for fun and we were on top for long passages of play. “Certainly in the second half we dominated possession, bossed the game and had Nantwich living off scraps. Blyth’s display was full of panache, vigour and confidence. And this despite being without some senior players. Wade added: “We were without Robbie Dale, Stephen Turnbull, Damen Mullen, Dan Hawkins and Peter Jeffries. Ten of the starting line-up were aged under 22 but they stood up to be counted really well. “So, bearing in mind all the circumstances, getting a midweek point away against a side who have a good home record has to be an achievement. “We were helped, I have to say, by our supporters who were brilliant again following us on the road. “Those fans never get on the players’ backs when they do something wrong. It’s simply pure support.